Victoria McQueen discovers her mind can do something very special - it can summon a bridge that can transport her anywhere she wants to go. One day, in a fit of dangerous thinking, she finds herself within the vicinity of a very unstable child abductor; Charlie Manx. Escaping Manx was a turning point in her life, and now, years later, she has a son of her own, and Manx seeks revenge on the one that got away. Imaginative would be one word I’d use to describe this; crazy would be another. Not only does it implement so many different things, it does it exceptionally well. If I were to list off the elements that Hill includes, I’m sure you would (if you haven’t already read it) raise an eyebrow or two - I certainly did at first. I had no idea just what I was getting myself into, until it was too late and I was swept up into the mind blowing and twisted biography of Victoria McQueen. It started when she was just eight years old; a child that had a mind filled with fantasy, seeking some semblance of freedom upon her Raleigh Tuff Burner. I do favour tales than span a character’s life, from a young to adult age, as it truly highlights development and progression. The journey of Victoria was a rollercoaster of tragedy, and at times I deeply felt for her. This isn’t to say I particularly liked her throughout the entire book, because there were moments she was depicted as a very selfish individual, but over time, I came to love and accept her. Due to her trauma, life shaped her into a broken soul, and none of it was fair. As for the numerous other characters, there were an interesting mix of personalities. Lou was a hero in his own right, and seriously a lovely person, whilst Bing was quite the opposite. He was the primary source of sexual violence, even if it was mostly glossed over rather quickly. Child molestation in fact didn't play a part at all in this book, thank goodness, so when I mention sexual violence, it relates purely to the abuse of adults. I just wanted to get that out of the way. Moving on to Manx himself, he wasn’t my most favourite antagonist. I prefer the charming, deceptive sort of bad guy, instead of the Joker-esque insanity, however he was most assuredly entertaining. The version of his inscape, “Christmasland”, had an undeniable, nightmarish vibe to it, and every time more and more of it was revealed, I became increasingly more fascinated. He truly had lost his mind, and I often wondered about his origins and how he came to be. I'm going to come outright and state that he wasn't a vampire, but the play on the title was pretty much summed up in the book itself. Needless to say, I'm sure there's a significant amount of history pertaining to Manx, that Hill could delve into, if he ever wanted to. Despite Christmas being a prominent theme, it in no way diminished the bleakness that radiated off every page. I found there to be a particular beauty in the dark atmosphere coupled with Charlie Manx’s eternally joyful outlook. I even appreciated the occasional sprinkle of humour, as Manx and his partner in crime truly weren’t the most coordinated of villains. The plot itself was padded out with unnecessary information, yet it’s something I’ve come to associate with works similar to King - and of course the son would be inspired by the father. Sometimes I don’t really mind the veering off; it’s dependant upon the overall story, and if I feel the distractions are worth the outcome. 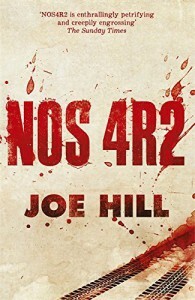 With NOS4R2, it was definitely worth it. I expected nothing less from the bittersweet ending. I got an idea of what would transpire, and I can't say my prediction was wrong. In conclusion: A masterpiece of weird. Vic "The Brat" McQueen was a star, in all her tattooed glory. I can't say just how much I loved it, and since it was my first experience with Hill's storytelling, I can't wait for more. She had said she could bring her bridge into this world but that in some way it also existed only in her mind. It sounded like delusion until you remembered that people made the imaginary real all the time: taking the music they heard in their head and recording it, seeing a house in their imagination and building it. Fantasy was always only a reality waiting to be switched on.